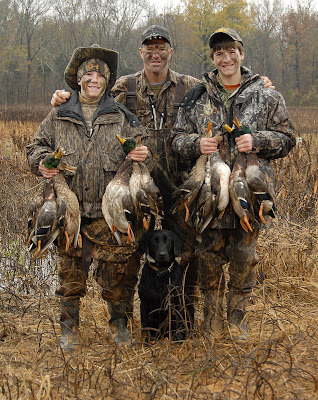 My son Hunter and I started the day in Northern Alabama, duck hunting with our good friends Greg and Tucker Voges. Hunter was taking advantage of liberal doses of mud and water to break in a new shotgun he had gotten for his 13th birthday a couple days before. A steady drizzle and a moderate wind kept the ducks flying until about 10:00 when we called it a day with twelve ducks to our credit. Tucker's momma had laid down the law that Sunday afternoon was homework time so we drove him back to Nashville after a quick breakfast. We took about an hour to stop by the house, throw our wet hunting clothes in the dryer, and eat a bite of lunch before heading out to the woods with full bellies and warm clothes. As we climbed a white oak tree on the edge of a small field, the wind picked up to about ten miles per hour and the rain began to fall again. It was pretty miserable, but we forgot all about discomfort when three does and a button buck materialized in the field. We were treated to the most amusing show of deer behavior I have seen. The lead doe was obviously in heat and the little buck was so stirred up he just couldn't stand it. Every time he would get a whiff of phermones, he would jump straight up in the air, run around in circles, spar with the nearest tuft of grass, and generally act like a rambunctious puppy. It was all we could do not to laugh out loud at his misguided testosterone surges. After about five minutes of watching the little buck's antics we noticed the does focusing their attention on the trail where they had entered the field. In a couple minutes a nine pointer stepped out into the open. Hunter made a good shot on him so we got down immediately to take advantage of the few remaining minutes of light. The rain made blood tracking impossible, so we had to hope we could spot him in the woods. After about five minutes of looking, Hunter found the buck in a small hollow about fifty yards off the field. 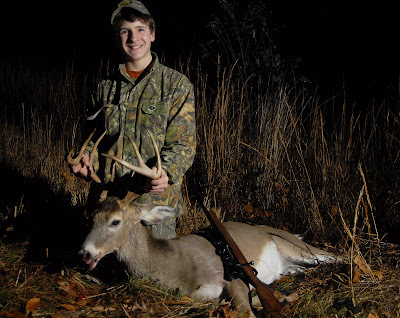 It was Hunter's first "mounter" so he was ecstatic that he was going to finally get a buck of his own on the wall. He called his mother and said, "put on some lard and onions, I'm going to gut you a buck," a quote from our favorite deer hunting (sort of) movie, Escanaba in da Moonlight.